Auntie M has guests this summer to give authors you might not have heard of a chance to tell you about their books. But today she wants to share the best of what she’s been reading whilst others are blogging away. These are some of summer’s best reads for crime. 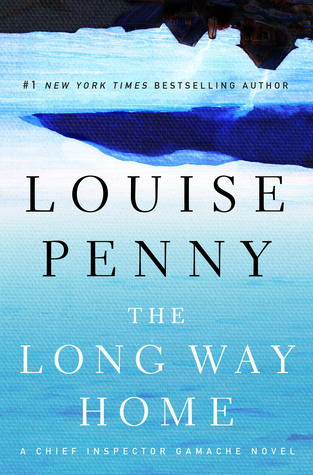 After last year’s profoundly moving How The Light Gets In, it is difficult to imagine how Louise Penny could conjure up a way to bring Armand Gamache out of his hard-won retirement. In The Long Way Home, it takes his friendship with artist Clara Morrow to do just that. After a year’s separation due to her husband jealousy over Clara’s career upturn, Peter Morrow was supposed to return home for them to sort out their marriage and decide if it could continue. Yet that deadline has come and gone and Clara knows something has happened to keep Peter from getting in touch with her. Despite not knowing what his feelings are, she insists he would never not have tried to contact her. Together with Jean-Guy Beauvoir, Gamache will assist Clara and her friend Myrna as they retrace Peter’s steps in an effort to locate him. 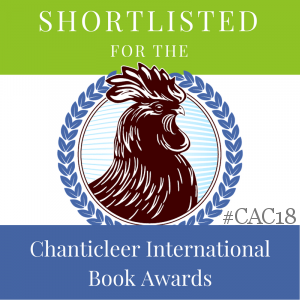 Their journey will take them from the art school where Clara and Peter met, to some of his unusual and despised family, to a desolate place deep into Quebec where few have ventured and where few have returned from intact. The usual characters for Three Pines make their appearance, but it come down to this group of four to unravel where Peter has gone to find his soul–and why. As they find themselves drawing closer and closer to Peter, the foursome will face some unanticipated scenarios and dark moments. Written with her usual style and an unerring sense of human nature, Penny’s newest will bring readers on a journey where things are turned upside down, just as the book jacket suggests, to final unexpected climax. 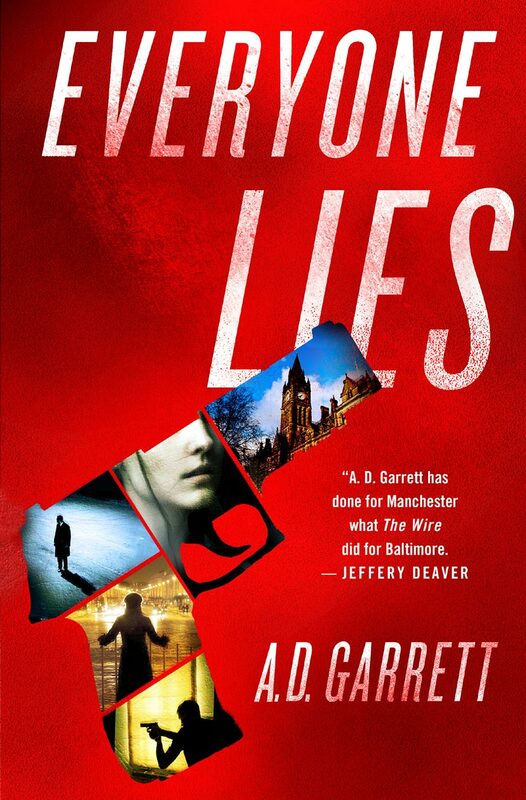 A. D. Garrett is the pen name for two authors collaborating in a way that brings forensics and mystery to the forefront in Everyone Lies. Auntie M has read and enjoyed other mysteries by Margaret Murphy and here she teams up with forensic scientist Professor Dave Barcaly. Their main characters echo their expertise. DI Kate Simms was demoted in the past for her work on a case involving Prof Nick Fennimore, a one-time advisor to the National Crime Faculty, a man whose mind and forensic knowledge equal none other. Despite their complicated past, Simms will reach out to Fennimore for his expertise when a string of drug addicts die and she suspects the drugs are laced with more than the usual cutting agents. 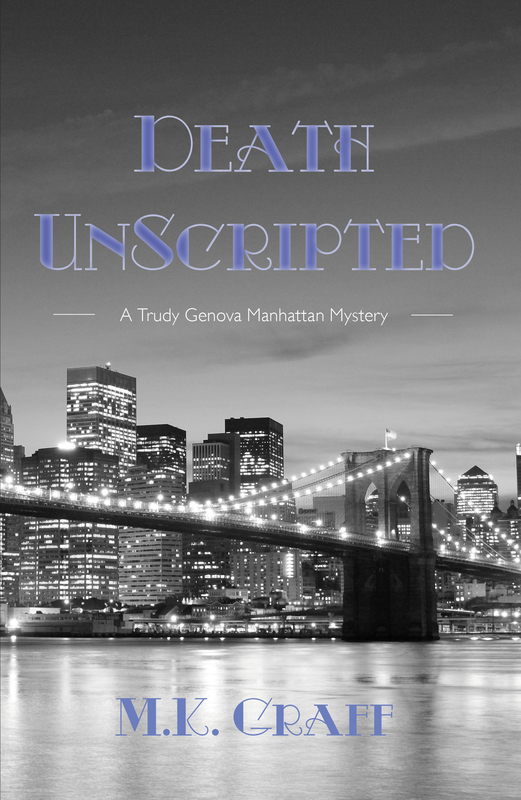 Her investigation becomes high profile with the death of a celebrity in the mix and the media becomes involved. There will be whore houses to search and drugs to chase, and a convenient fall guy for what may turn out to be a hidden agenda of the deepest proportions Simms could imagine. Seemingly thwarted by her superiors and her own past, Simms struggles to find out why these deaths are occurring, along with the identity of one of the girls, a prostitute who may or may not have been involved on her own. Her own family life suffers. The plot is complicated but satisfying, filled with all kinds of the best scientific analysis and facts for those of us who like those angles. With two unusual protagonists, readers can hope this duo will be brought back for a sequel, and soon. Steph Cha’s sequel to Follow Her Home is the compelling Beware, Beware, featuring one of the most original protagonists to come along in a long time: Juniper Song, a Marlowe noir fan working as an apprentice to the PI firm she found herself involved with in Book One. Song’s Hollywood location brings her right into the glitzy scene with her first case when New York artist Daphne Freamon asks the young investigator to follow her screenwriter boyfriend around. Jamie may be using drugs again, and Song quickly establishes this to be the case. Working for an aging movie star, Jamie is soon the prime suspect after a night of partying finds the star dead in his bathtub. Is it suicide or murder? Now Song’s job becomes proving Jamie’s innocence. With lies, blackmail and hidden secrets coming to light each time she turns around, Song will find things hitting too close to home for her comfort. And then things turn on a dime and she must decide how much her conscience can bear in the name of justice and revenge. Fast-paced and definitely with an different edge, Steph Cha has created an Asian American character whose culture adds a layer to the action. 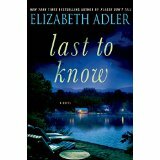 Elizabeth Adler continues her Mallory Malone-Harry Jordan series by taking readers to western Massachusetts Evening Lake in Last to Know. Smarting from Mallory’s departure to Paris after breaking up with him, the Boston detective is spending time at his lake house with his dog, Squeeze. The small close-knit community is about to be blown apart by two newcomers: Lacey Havnel and her daughter Bea. One family, the Osbournes, will become particularly involved. Husband Wally is a well-known writer of horror stories; wife Rose is the ultimate wife and earth mother. 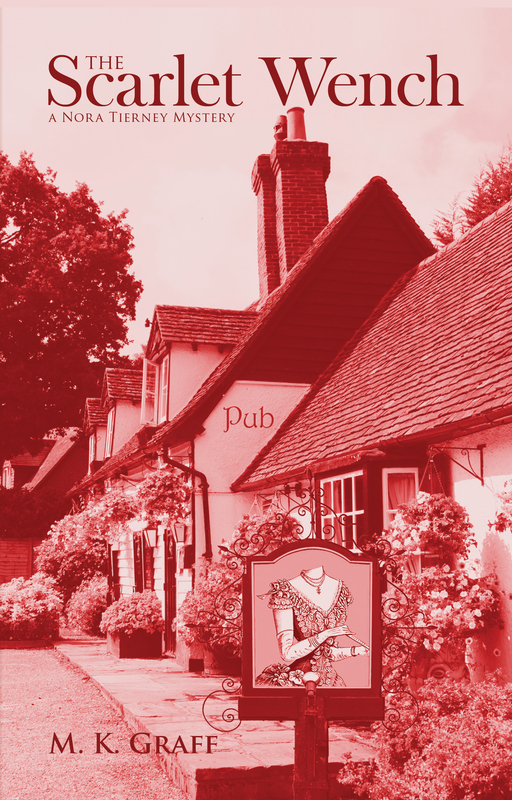 Four children in varying ages occupy their home near Harry’s. All will become involved with Be a Havnel when Lacey is killed when the duo’s house explodes. Then it’s determined that Lacey was murdered before the explosion, and that the mother-daughter team are not who they claim to be. Harry must decide if he can keep his job if it means living without Mallory just as the murderers begin to pile up. One device Adler uses is to tell the story through varied points of view, so that readers are getting more information than Harry is privy to. A page-turner and great beach read. 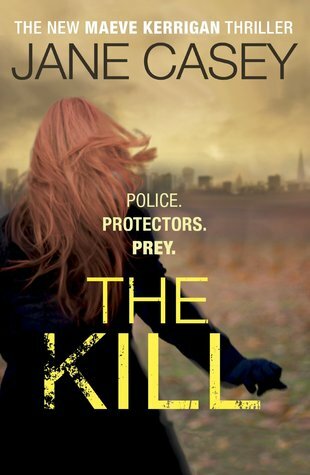 Jane Casey’s Maeve Kerrigan series returns with the fifth, The Kill. 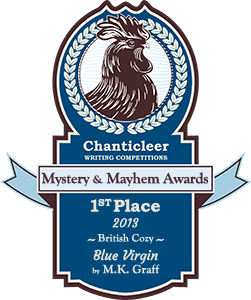 With an intriguing plot and fast pacing, this is a smooth read that will translate well to television, and Auntie M won’t be surprised to see the series has been sold for that purpose very soon. DC Maeve Kerrigan and DCI Josh Derwent are working alongside the rest of the MIT to unravel a series of police killings in metropolitan London. Someone is killing their police colleagues and everyone is on high alert to find the murderers. Are they killings all the work of one chief or is there more happening here than meets the eye? Casey’s hallmark of the series is how she combines police procedural information alongside relationship development and subplots, especially as pertains to her superior officers, and most importantly, the misogynist DCI Derwent, as complex a character as there ever was to leap off the page. Kerrigan is tough, yet has human frailties, not the least of which is her worry about her handsome live-in boyfriend. When things turn upside down there, you will feel her ache as she’s unable to to comfort him when his colleague is murdered. This is subtle, smart writing at its best. A great series if you haven’t found it. NEW IN PAPERBACK: Jane Haddam’s Hearts of Sand, previously reviewed, is now in paperback for fans of retired FBI profiler Gregor Demarkian, who visits a Connecticut beach town to resurrect a decades-old disappearance and murder.